The real credit goes to my brother, he is installing this one. Liam; didn't I tell you that you were an artist? Put that on a piece of marine plywood and you could sell it for enough to keep you warm this winter! I will make a neat frame in my shop and we could transport it to the art galleries in a truck. I was thinking so. 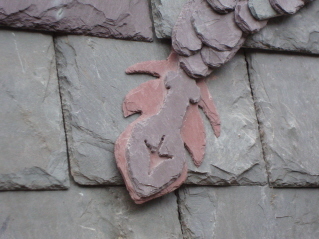 Very neat detail! 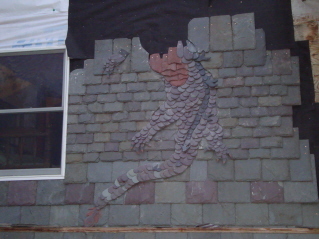 The tail is attached by nailing and drill into the slate behind it. 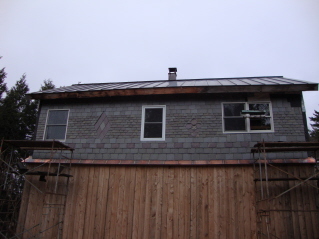 This is not the typiccal slate siding project. There are parts/details in the hand, foot, and wing that are relying on adhesive. Also pcs are so small it hard to weave the different sizes together. 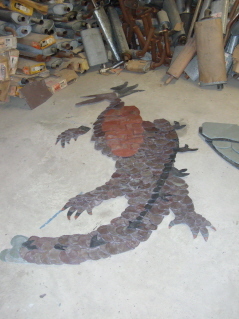 To get a more of a 3-d look, making the tail this way it should look more alive. 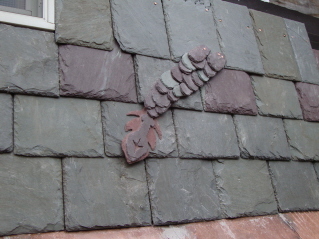 Do you just attach those pieces through the existing slate, are are they installed as you go?